This is Lomondhills Stand By Me who we affectionately know as Scottie! He is miniature size, expected to reach around 15-16" at the shoulder and around 10-12kg. 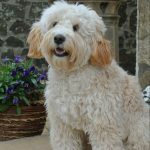 He has a lovely soft dark gold loose fleece coat with white markings. His father is red and his maternal grandfather is parti, so he may be parti factored. He is a solid little boy with good correct structure and great movement. His ears are well set, his tail is sabre and his teeth are normal. Scottie is a confident and playful, but also very relaxed laying on his back in your lap! He is very social and people-focused. 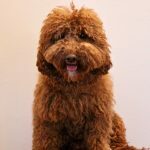 Scottie comes from a combination of traditional and new Australian Labradoodle lineage, so will be a great asset to breeders looking for new blood. Scottie comes from well health tested lines, but we are currently in the process of testing him for prcdPRA, vWD, EIC, DM and IC so that he has his own clearance certificates are are not relying on 'clear by parentage' results. We are in the UK and are happy to work with approved overseas breeders. Please contact us if you are interested in adding Scottie to your programme.